In many cases, divorce comes as a surprise to a spouse and there are understandable feelings of loss and grief. This is a big reason why divorces can get contentious and emotionally-charged. There is an inherent tension between the emotional trauma associated with a divorce and the practical, legal issues that need to be addressed to finalize a separation. Rational decision-making becomes more challenging because the spouse is forced to process an incredible amount in a short period of time. There are some people who can compartmentalize the divorce and their feelings of pain and wait until the divorce is complete before actually going through the stages of grief. However, many people are forced to process through the stages of grief simultaneously with the litigation process. The first stage of grief is to simply deny the hard truth and reality of their particular situation. It is a defense mechanism intended to help you cope with the initial intense pain of loss. When you eventually accept the fact that you are getting divorced, denial is usually supplanted by feelings of anger and rage. 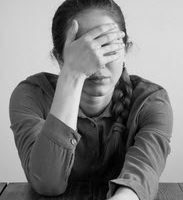 You may ask yourself, “why is my spouse doing this to me?” The feelings of anger stem from feeling vulnerable and uncertain about the path forward. In many cases, these feelings of anger wind up being directed at people other than the spouse, including the lawyers involved in the divorce. A person may try to bargain with the other spouse in order to try one last-ditch effort to save the marriage. Or, they turn to a spiritual force (e.g. God) and ask for supernatural assistance with their marriage. Depression is where many people going through a divorce spend the majority of their time. There are varying levels of depression ranging from intense feelings of sorrow and helplessness to contemplating suicide. If you are feeling depressed, it is extremely important to talk with a professional to get the help you need. The last stage of grief is an acceptance of the loss. You have accepted the reality of your situation and moving on. Getting divorced is emotionally and psychologically difficult. But it is important to remain optimistic and positive. Thousands of people have gone through a divorce and come out the other end happier than they have been before. The key is to keep pushing forward and viewing your life after a divorce as an opportunity. The law firm of Lindamood & Robinson, P.C. knows full well how difficult divorce can be. For decades, our team of Houston divorce lawyers has represented thousands of Texans in divorce litigation, custody disputes, and so forth. When you retain a lawyer from our firm, you are getting both a legal counselor and a partner in this journey. We are there to answer any questions you have about the divorce process and offer sound legal advice.